Android Mobile Me Developer Options Kya Hai? 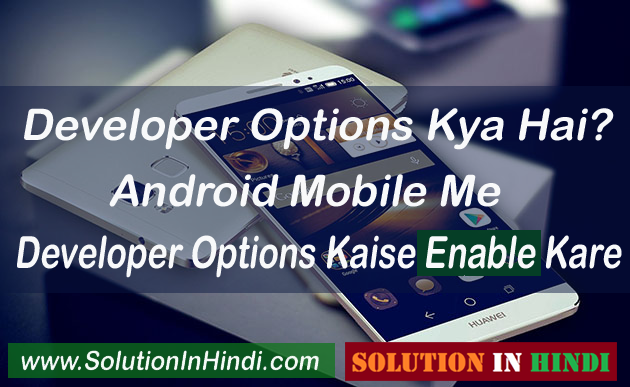 Android Mobile Me Developer Option Kaise Enable Kare? Jee-Haan Friends Aaj Ham Baat Karenge Developer Options Ke Bare Me. Jaise Ki Ham Sab Jante Hai Android Mobile Kitne Tezi Se Badh Rahe Hai. Abhi Lagbhag Har Ek Persion Ke Pass Smartphones Mil Jate Hai. Apne Kabhi Device Settings Me Jake Note Bhi Kiye Honge Agar Apke Mobile Me Pehle Se Developer Options Enable Hai Toh. Dosto Android Mobile/Tablet Me Hidden Feature Hai Jo Common Smartphone Users Ko Nahi Pata. Ya Phir Developer Options Ke Bare Me Sahi Se Information Nhi Hota Hai. Agar Ap Nhi Jante Developer Options Kya Hota Hai And Developer Option Enable Kaise Kare. Ya Phir Apke Smartphones Me Developer Options Pehle Se Enable Hai. Our Aap iske Bare Me Nhi Jante Hai Toh Bhi Aap is Post Ko Carefully Read karte Rahe. Kyu Ki Developer Options Bhut Hi Helpful Feature Hai. Jo Har Ek Android User Ko Iske Bare Me Pata Hona Chahiye. Toh Chale Jante Hai What Is Developer Options? Dosto Devloper Options Android Mobile Ki Hidden Feature Hai, Jiske Bare Me Sabhi Smartphone User Nhi Jante. Devloper Option Ko Mobile User Ki Extra Recuirement Ke Liye Design Kiye Gaye Hai. Jiske Madad Se Aap Bhut Kuch Easily Kar Sakte Hai. Developer Options Se Aap Apke Androd Mobile Ki Performance Ko Improve Kar Sakte Hai. Mobile Look Bhi Changes Kar Sakte Hai. Or Bhi Bhut Kuch Ayse Hai Jo Aap Devloper Option Ko Enable Kar Ke Kar Sakte Hai. Kyu Ki Ye Feature Android Mobile Ki Advance Settings Hai. Yah Options Specially Developers Ke Liye Hai Jo Application/Software Ki Testing wagaira Karte Hain. Phir Bhi Agar Apke Ander Se Question Aa Rahi Hai. Ke Devloper Options Kyu Use Kare. Toh Is Post Main Apko Thoda Bhut Idea Laga Deta Hu Ke Aap Devloper Se Kya Kya Kar Sakte Hai. Developer Options Ko Enable Karke Apke Phone Ki Performance Ko Bohat Fast Kar Sakta Hai. Background Me Chalne Wale Application Ko Manage Kar Sakta Hai. Maximum 4 Apps Ko Background Me Run Kar Sakta hai. Apke Phone Screen Par CPU Details Dekh Sakte Hai. Android Mobile Ki Activity Delete Kar Sakte Hai. Charging Ke Time Mobile Display On Rakh Sakte Hai. Our Bhi Bhut Sare Features Hai Jo Aap Noot Rooted Mobile Se Kar Sakte Hai. Next Article Hidden Developer Options Tips & Tricks Ke Bare Me Puri Jankri Hindi Me Janenge. Toh Chale Jante Hai. 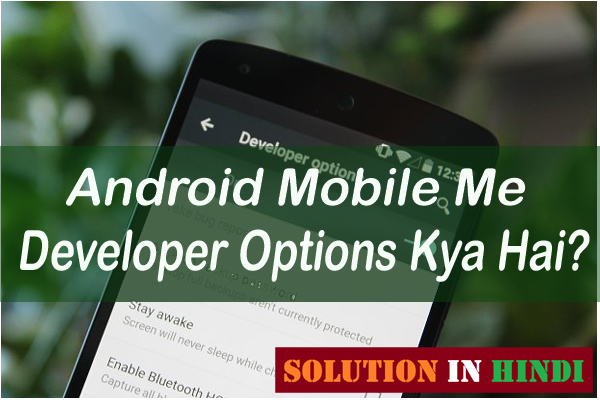 How to get developer options on Android Phone/Tablet In Hindi. Step 1 Sabse Pehle Device Settings Me Enter Kare. Step 2 Setting Me Aagaye Hai Toh About Phone Par Click Kare. 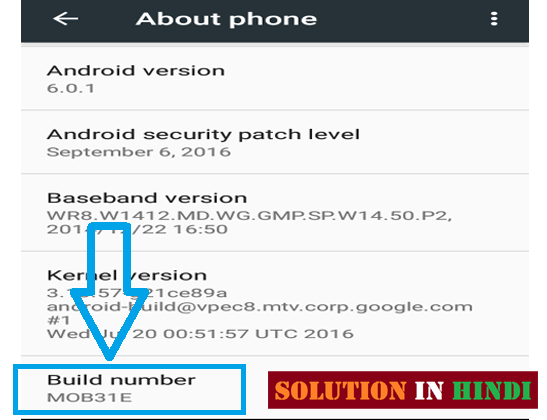 Step 3 Ab About Phone Me Build number Find Kare. Step 4 Ab Build number Par 7 Times Click Kare. Display Me You Are Now Developer! Show Hogi. Done! the Developer options will be Successfully unlocked and available. Ab Developer Options Apko Main Settings Me Mil Jayenge. I Hope Android Mobile Me Developer Options Kya Hai? 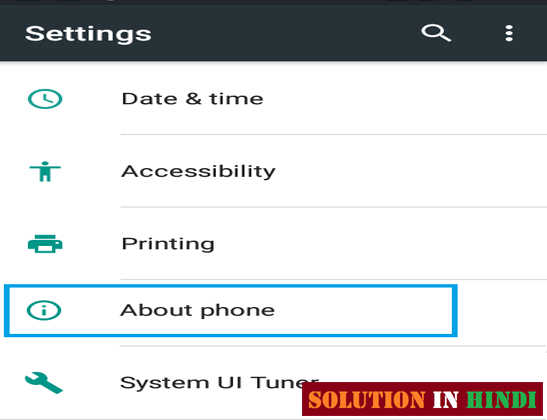 Android Mobile Me Developer Option Kaise Enable Karte Hai? Puri Jankari Hindi Me Sikh Gaye Honge. Kisi Step Me Ya Phir Developer Options Related Koy Bhi Question (Sawal) Hai Toh Comments Kar Sakte Hai.